A Survey has been developed to document and compare GIS utilization in the workplace. This survey assesses GIS availability and utilization in both academic and non-academic work settings (including workstudy and student employment). The purpose is to document the need for GIS experience as an occupational skill. GIS is currently being underutilized by most companies. Spatial Technician and Analyst activities and a few managerial activities requiring GIS knowledge or background are reviewed. 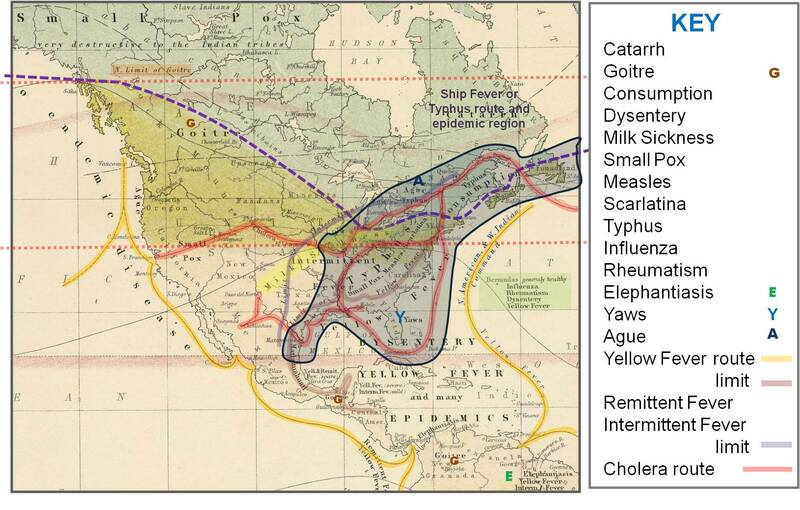 Second to John Snow’s cholera map is Alexander Keith Johnston’s (1844-1879) c.1856 map of world disease patterns, perhaps the most cited map on world medical geography history. Johnston’s biography at http://en.wikipedia.org/wiki/Alexander_Keith_Johnston_(1804%E2%80%931871) is in need of serious editing and additions. The speech related to Johnston’s map and its published version in Transactions of the Epidemiological Society of London, 1856, have been reviewed as well at this site (LINK). There is also a link to Johnston’s Map at the David Rumsey’s site to pursue. 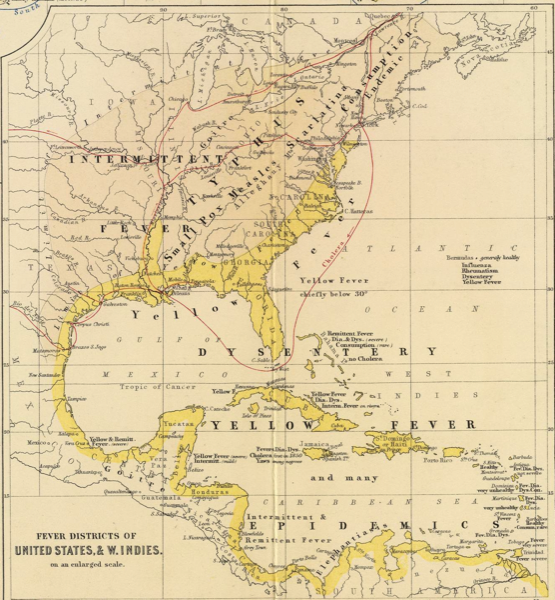 I say circa 1856 because this map was probably in the works in Johnston’s head as early as 1854 or 1855. According to some readings, he was discussing the value of such a map at the meetings held regularly by the local medical societies and Royal Physicians, a few brief notices of such appearing in a few medical journals published around this time. One notice states that such a map was displayed or the likings thereof, a year or more just before the publication of the second edition of his book Physical atlas of natural phenomena (1ed 1856, 2ed 1861/2). Johnston’s map is based on a combination of personal lessons he learned by viewing other maps for the time, along with some professional experience. He based the scientific portion of this map on the distribution of isotherms from another map he already created. To this he then added several decades of notes published by colleagues and predecessors about local disease and epidemic/endemic obsevations, and some retrospective studies of controversial disease histories during the colonial exploration and post-colonial settlement and industrialization years. 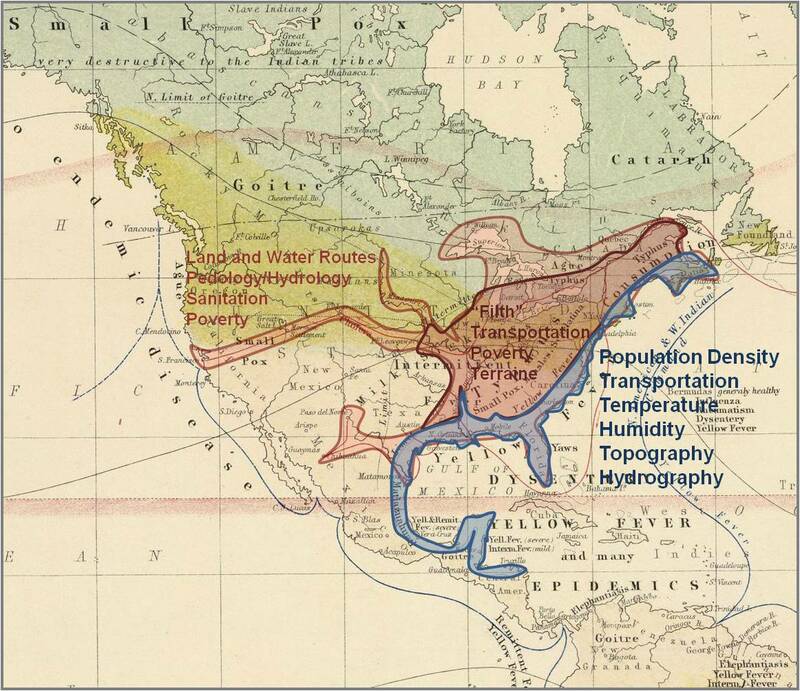 The goal of Johnston’s thematic map was to define the distribution of health and disease based on latitude-longitude, temperature, climatic, temporal, and topographic features. Many of the diseases on Johnston’s map appear on maps published elsewhere in the journal. Still other diseases were previously unmapped and placed on a map for the first time by Johnston. These diseases have an interesting history, like the Aztec disease matlazahuatl and the consumption mapped by Henry Bowditch reviewed in detail elsewhere on this site. Johnston’s Health & Disease map begins with a map of the earth, with the torrid, temperate, and frigid or arctic zones defined based on a traditional isotherm map. The torrid zone surrounds the equator. The temperate zone (yellow regions) is edged approximately by the [~60] degree isotherm, and the frigid zone (light blue) by the [~40] degree isotherm. Based on his interpretation of past articles on various diseases and epidemic histories, the following map was produced, about the same time Adolph Muhry produced his disease map. 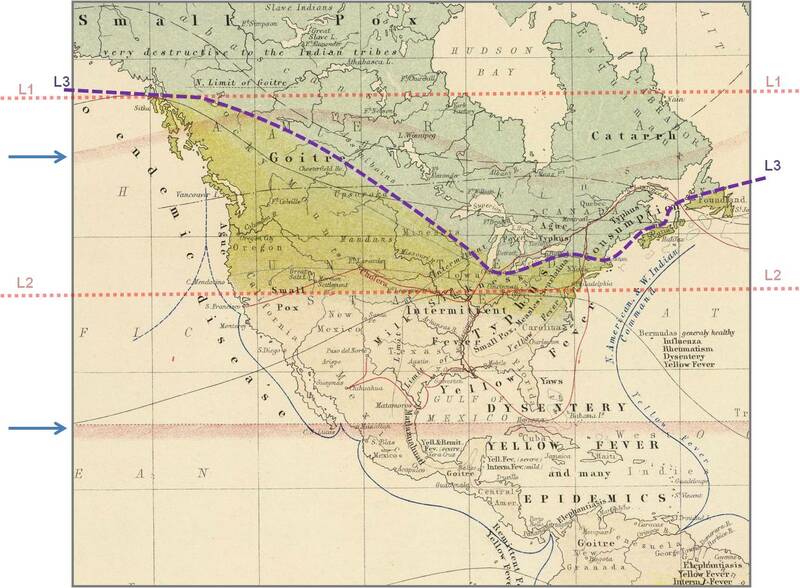 The following is a section of this map centered on the North American continent. Nineteen diseases or medical conditions are detailed spatially on this map. The majority of these diseases are endemic or epidemic in nature. A few of them are very well defined spatial disease patterns, which during the 19th century had both regionalism and culturalism values also assigned to the diagnoses and definition of susceptible ‘regions’. The most culturally linked diseases on this map with regions very well defined are perhaps yaws [Florida] and elephantiasis [Venezuela and Brazil]. The places where goiter is noted are defined by sociocultural agricultural behaviors and history, and latitude-related climatic and topographic features. Matlazahuatl Epidemic of 1736-1737. The deadly matlazahuatl which had devastated Mexico’s Indian population in 1545 and 1576 reappeared in August of 1736 at Tacuba, spreading swiftly through the country (Bancroft 1883:III:353). The contagion (probably typhus) reached the City Of Mexico toward the end of November. Poorer people suffered greater fatalities from this virulent fever (Alegre 1841:111:262). Nearly all the Jesuit missionaries in New Spain fell ill from this disease (which says something about their personal hygiene if the epidemic were typhus!). The mortality in the City of Mexico was given as 30,000 by the official publication of the government, but the Jesuits estimated it was nearer 40,000. Over 50,000 died in the city of Puebla, and over 20,000 in Queretaro and environs (ibid., III:267). Farther from statistically minded royal officials, mortality estimates are lacking, but the death rate was undoubtedly high throughout New Spain. These electronic book pages begin at http://parentseyes.arizona.edu/tubac/toc.htm. Alegre, Francisco Xavier. 1841. História de la Compania de Jesus. México: J. M. Lara, 3 v.
Bancroft, Hubert Howe et. al. 1883. History of México, Volume III. 1600-1803. San Francisco: A. L. Bancroft and Co. This disease has also been likened to yellow fever, which its areal topography might support, but not its complete temporal history or symptomatology. Contemporary writers use this to refer to typhus. See google books item on this–Joseph Jones. Outline of Observations and Investigations on Yellow Fever, The Medical Times and Gazette, Nov. 6, 1873. pp. 519-520 (part 1). See also The New York Journal of Medicine, March, 1844, Original Communication from William H. Prescott and Washington Irving, Esq., … American Origin of Syphilis; with additional remarks descriptive of an Epidemic Disease, termed Matlazahuatl, which prevailing among the Native Americans, has been supposed to be analagous to Yellow Fever… . Other reference: La Nueva Espana Y El Matlazahuatl, 1736-1739 by America Molina del Villar and Amâerica Molina del Villar (2001, facsimile reprint, Illustrated). Zones. The Frigid zone is blue, the temperate zone yellow, the tropical or torrid zone not highlighted in the original map. Transportation Routes are barely noticeable, but are redrawn with stronger lines in later versions of this map. Small Pox. Notice that the Small Pox regions are typically distributed in fairly rural if not wilderness regions. 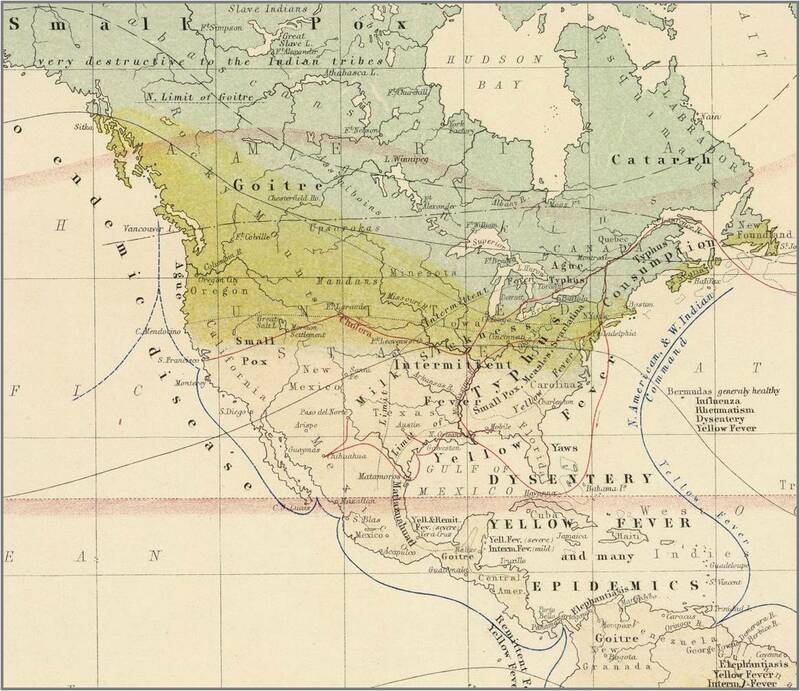 This feature of small pox is noted in the Pacific Northwest region just north of the Canadian border, and in the appalachian region (in smaller text, next to “Typhus”). This same high elevation, wilderness pattern for small pox is noted in the late 19th century Mexico disease map covered elsewhere on this site. By the time Johnston produced this map, the cause for small pox was very well known and its relationship to indigenous people almost completely understood. Therefore, it is safe to assume that Johnston’s decision for labeling these two regions as small pox prone was somewhat subjective, based on his knowledge drawn from other sources about indigenous people and territories. Milk Sickness. [from Texas to the Great Lakes] The primary cause for this malady is the Eupatorium species growing in the Great Plains (see other page in this site on this). One other species of Asteraceae is also linked to this condition. 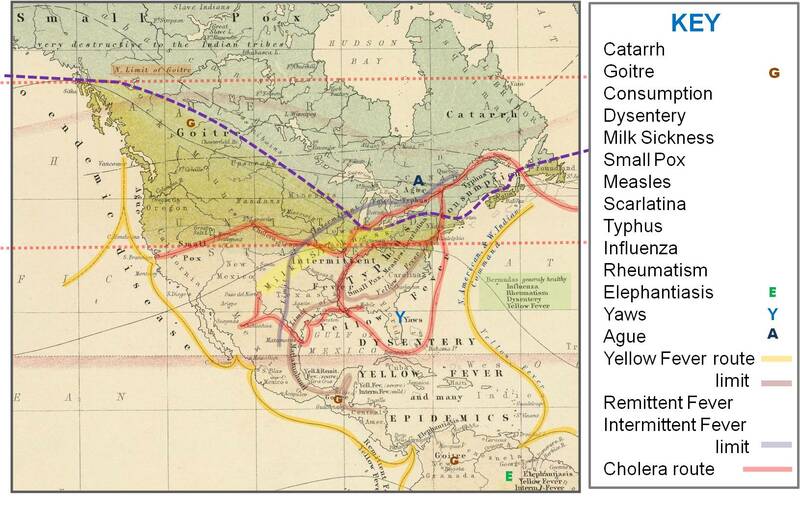 Knowledge about the cause for milk sickness was not yet been perfected by physicians, and so Johnston’s map is largely based upon regional health information obtained from the Pioneer’s physician’s fairly recent recounts published within the medical journals. Settlers of the western Kentucky and Ohio states, between 1805 and 1825 approximately, were the first to document this ecology specific malady, but could never identify a possible cause. Repeats of these events are seen when the major overland trail migrations commenced between 1845 and 1856/7, with a narrow zone in mid-Nebraska resulting in milk sickness deaths. By 1860, wagon trains were pretty much replaced by stage coaches, the far west very well settled, and so the ability to stake a land claim was no longer an option for western travelers reporting on this disease. Goiter regions are very rural and in colder climates. This medical condition was due to lack of iodine consumption, a nutritional illness common to regions distant from oceans and maritime setting. In addition, some of the flora of these cold temperate to warm frigid regions made these regions more likely to result in this condition in endemic form. The thiocyanate rich brassicaceae plants (cabbages, mustard greens, etc.) were a major cause for this malady. Catarrh. essentially what we refer to today as “runny nose,” with and without the common cold infection, due in part to the climatic conditions. Matlazahuatl. Transl. “net eruption of spots”, Aztec. Probably typhus brought in by ship rats. Discussed above. For analytic and descriptive purposes, the following notes, figures, etc., were added to Johnston’s map, in increasing order of complexity. These maps are for the most part self-explanatory. But a little text is added for clarity, along with interpretation notes. The Key lists the diseases noted on this map; several of these have letters used to indicate their small ara locations. L3 is the Frigid Zone border. The yellow fever route (yellow) and limit (salmon, hugging the Atlantic and Gulf shorelines) are added. Further inland is the Remittent and Intermittent Fever limit. Intermittent was usually ague or malaria, but notice the ague is a separate fever area [A]. This particular fever had its limits, which were not yet fully defined. 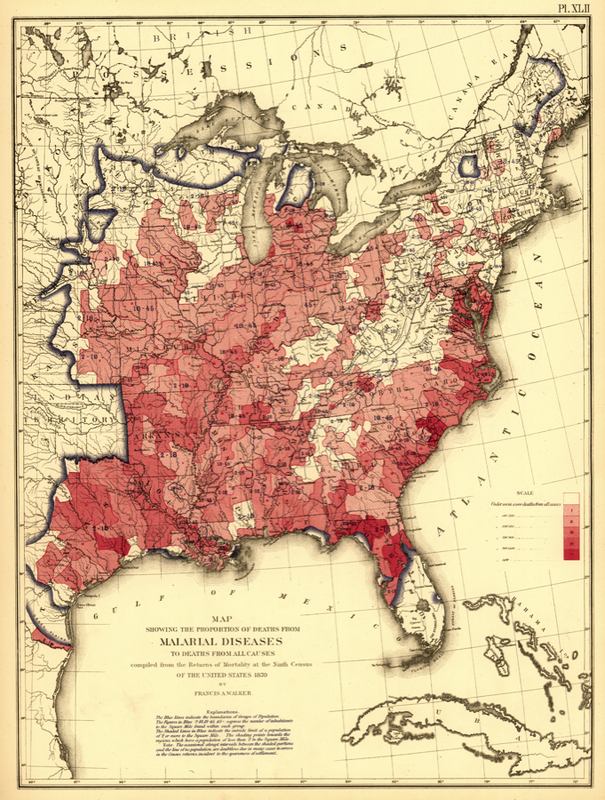 The next map is a US malaria map produced just a few years later in 1870. The Asiatic cholera route (bacterium vibrio cholerae) is defined. 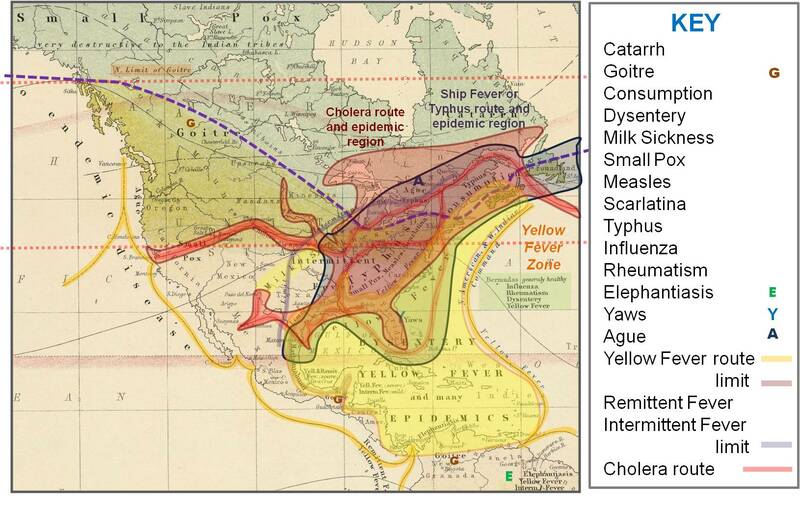 Three disease zones or regions are defined based on the migration routes. Typhus and typhoid fever have not yet been fully differentiated. Both came in by ships (thus the name ‘ship fever’ in the mortality lists), but in the winter, this true typhus transmitted by rats was the form that prevailed. In a study of Illinois medicine it was noted in the published 1850 mortality lists and the history of Adams and Warren County areas (my biographical work on John Kennedy Bristow) that an epidemic occurred during the cold months; it was distributed in relation to ships docking along the Mississippi River and its Illinois tributaries heading into Peoria. This was more than likely due to typhus, generated by rats on board the ships, versus typhoid fever, a result of Salmonella typhi and allies introduced into and residing in contaminated waters. An additional complication to this study is the tendency for mosquito-bred or mosquito-season febrile diseases to be referred to as typhus or typhoid as well. These two weren’t fully differentiated until much later in the 19th century. See more on this on the page reviewing the Central Mexico disease geography map. The dark purple zone depicts the distribution of typhus by ships according to Johnston’s map (excluding the 1570-1800 history of matlazahuatl). Smaller boats were commonly ascending the Missouri and Mississippi River tributaries west of Iowa (for example, see 1835 newspapers of Illinois and northwestern territories with notes on small dingies transporting food, wares and people into the Dakota-Montana Forts and Astorian fur traders’ settlements and trading posts). The reloading of these much smaller ships with smaller amounts of produce from large freight ships probably cleaned the stores somewhat of rodent pests. The Yellow Fever zone is added, but notice this covers mostly the neotropical settings and does not travel too far inland on the continent proper. The dysentery noted in the warm climate settings is due to poor hygiene, but may have some amoebic dysentery links. Most of the evidence suggests that the amoebic dysentery induced by entamoeba did not penetrate the continent until much later in the continent’s history. Opportunistic dysentery is also possible(see my thesis), but the proximity to ocean transport routes and lack of goiterogenesis in this region suggests that such was probably not the case. The possible cause(s) for this dysentery have been to be reviewed. Compare the above with the next map by Johnston on Yellow Fever. Yellow Fever diffused primarily by oceanic travel routes and was limited by the need for proximity to shipping ports, ocean edges, and torrid and hot temperate zones. Its vector was a foreign mosquito brought in by ballast waters and barrels used to store water on board the ships. 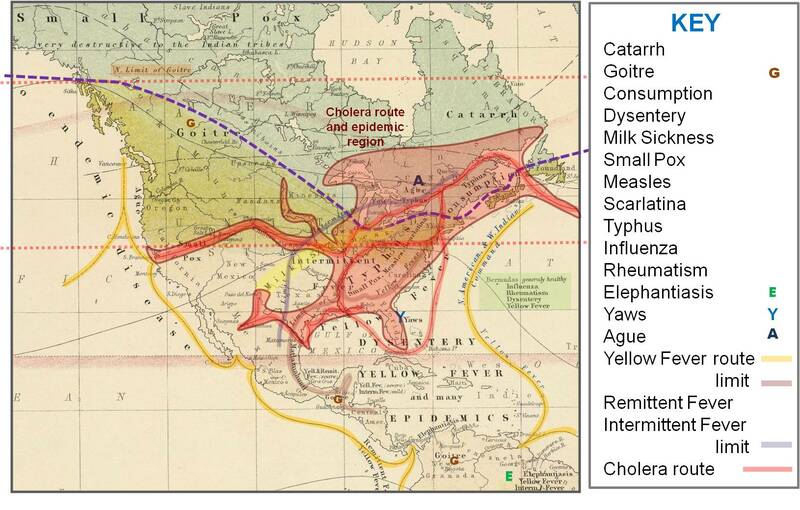 The Cholera zone [red] is added based on the disease diffusion or migration history reviewed in numerous 19th C medical books and journals, and pioneer diaries, journals and reminiscences (see thesis coverage for more). We now see three zones in relation to the torrid, temperate and frigid zones. Notice the disease most limited in terms of temperatures is yellow fever. Typhus and Cholera have similar behaviors, with cholera making its way overland, versus the shipping routes favored by yellow fever, and probably inland shipping routes favored by typhus. Cholera is the only disease to effectively make its way into the frigid zone, suggesting a much stronger correlation and link to people’s activities and behaviors. The climate can be quite different from its endemic regions in India and Pakistan, and yet still be capable of diffusing this disease inland due to human population behaviors. The host-vector relationship of cholera (vibrio bacterium-ispods-shellfish-mammals) differs from that of typhus (bacterium-rat-humans). 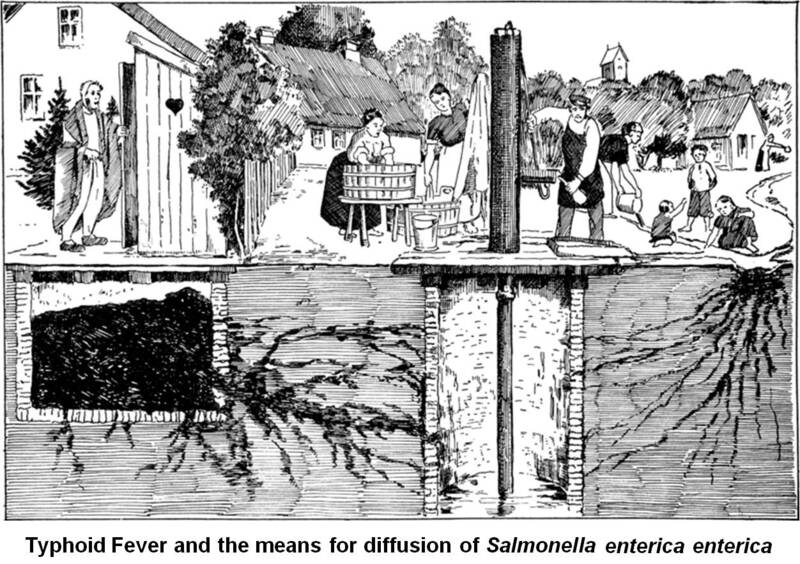 The zone depicts a disease that diffused along shoreline population settings and inland by means of water routes [for various reasons, regarding food storage and climate, rats tended to not follow the Overland routes adhered to by cholera]. Compare with the cholera zone map below. Cholera Zone, shipping routes and overland trails (red). 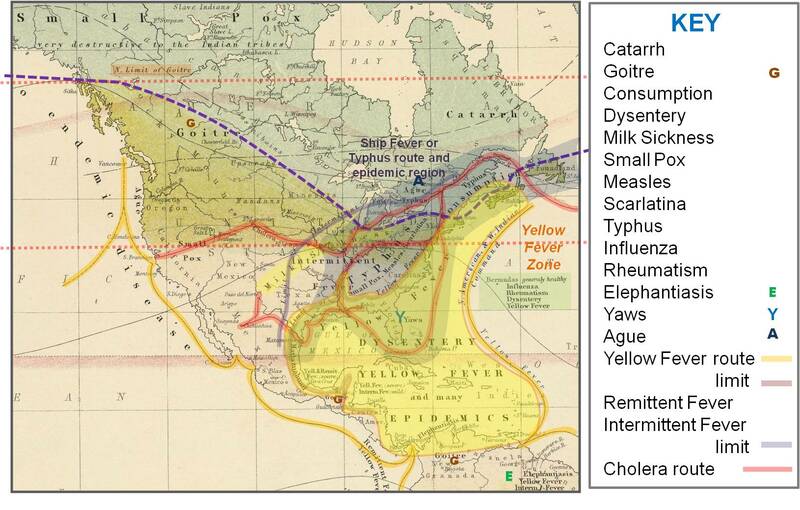 The yellow oceanic routes are not depicted in relation to cholera by Johnston but were primarily responsible for its diffusion to San Francisco in winters of 1849/1850 and especially 1850/1851, and perhaps even by ship to Astoria and Portland, Oregon by late summer 1852 (thesis work). For more on this, see the Star newspaper at Oregon Historical Society (microfilm), detailing life along the trans-isthmus route in southern Mexico during the peak Gold Rush years. See also Sandwich Island newspaper on microfilm at the same repository.